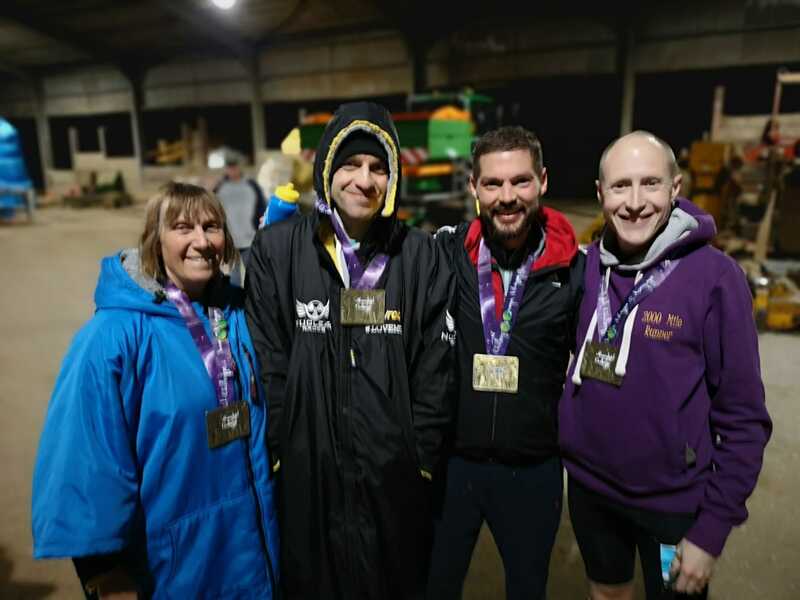 The SVN Moonlight Challenge on 23rd February 2019 starting at 3pm saw a smaller contingent of Coastal Striders set off this year from Brookes Farm at Reculver. 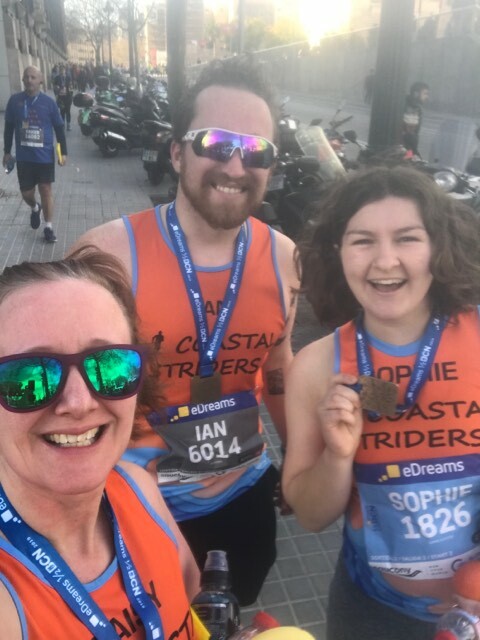 The weather was very pleasant and so the first three hours saw us enjoying running loops along some quiet sections of road, the edge of a ploughed field, which this year wasn’t too muddy, and concrete cycle tracks along the edge of the Thanet Way. The loops were 6.25miles so it was good to see an aid station at the top of the bridge as well as Brook Farm. 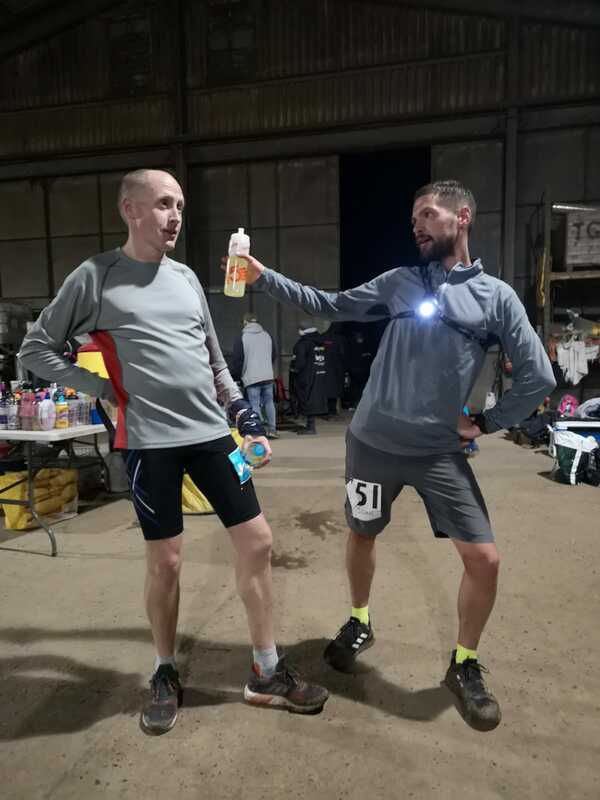 There was also an additional unofficial aid station for those who had cash or card on them as the Brewery at St Nicholas Court Farm was open till 8pm! We had great support from Kim and the girls and Sarah and Ros and it was good to hear the shouts as we ran by. One reason I love that we have our names on the Coastal Striders T-shirts. The sun set around 6 pm and the temperature dropped rapidly with mist around St Nicholas, particularly on the muddy track stretch where I found it quite spooky running ( well actually I walked the slippery, uneven bits as I didn’t want to end up with a mud decorated posterior) along on my own with just a small circle of white rainy mist lit up by my head torch. It was good to see pin pricks of torchlights spread out along the track at various points and the guys coming past, urging each other on. The guys put in some great times. Simon Ballard , John Whitcher and James Patterson all completed 43.75 miles. 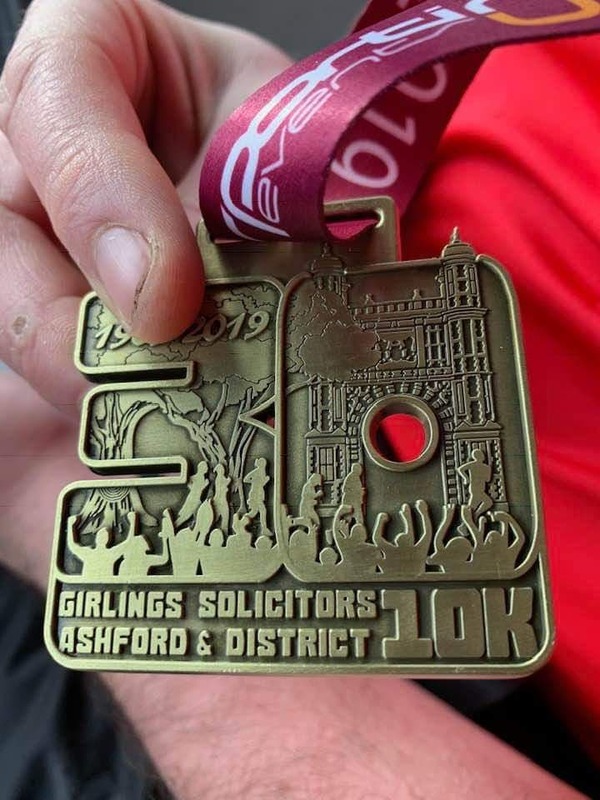 Simon in 6 hours 34mins, knocking half an hour off last years’ time, James and John in 7 hours 20 minutes, knocking 23 minutes off James’ 2018 time. Darren Ryan completed a 31.25 mile ultra in 5 hours 46 minutes and I managed my first marathon distance since 2016 in 7 hours 16 minutes. I might not keep up with the hares but the tortoise made it in the end. Determination won out. Officially labelled as challenging, and each and every person I asked about this race described it as tough. They weren’t kidding! So, on a wet Sunday morning we all rocked up to Betteshanger Country Park to gather and pick up our race numbers. Twelve representatives from Coastal Striders, plus some welcome support from those not running. The weather gave us an excuse to stay inside the registration tent for a while, then it was outside for the team photos once the rain had eased off. It’s a good ten minute walk to the start line from the park, but it did warm the legs up, and the weather had improved by then. Hilly…..If we weren’t running up a hill, we were running down one. My memory isn’t great these days, something to do with my age, but I can’t remember a flat bit. Strava tells me the steepest part was 10.4%, I think Strava is telling fibs. The hill reps on a Wednesday evening seemed to help though. Despite the undulating course, we all arrived back at the start line safely, and injury free. 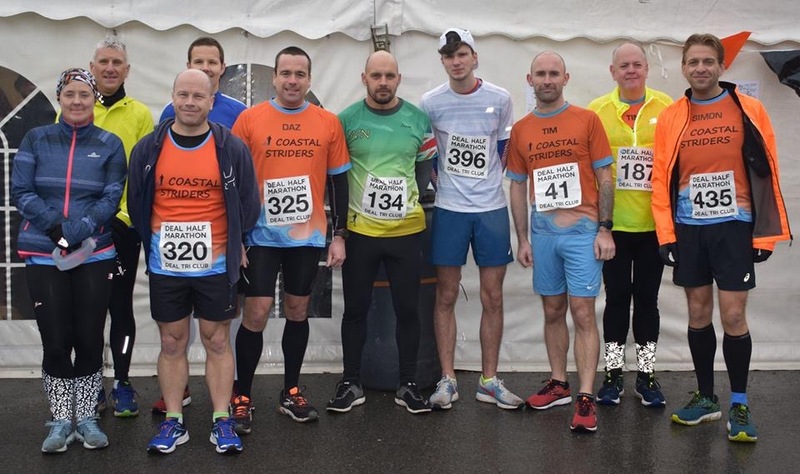 Simon Ballard being the first Coastal Strider home in 1:32:08, followed by Dave Paramor, myself, and Darren Sayer, all four home in under 1 hour 40 mins. 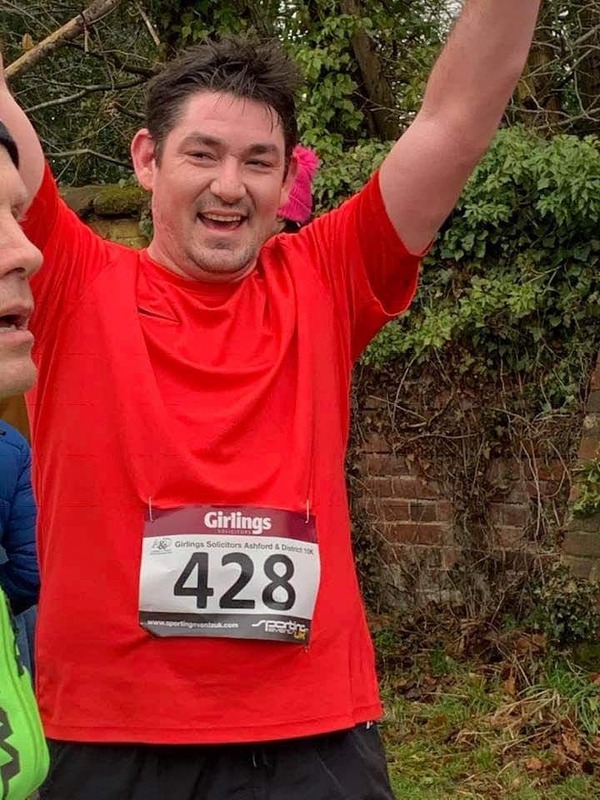 A massive well done to everyone who ran today, it was indeed a tough, but ultimately satisfying race, and one that required a little mental as well as physical strength. Some even went back to for second helpings, and to provide support for the rest of the club. Never leave a Coastie behind. Thank you to Kim, Mollie, and Sophie for the the much needed helping hand at the finish, and to Stacey for the brilliant photos once again. Thanks also to The Deal Tri Club for a well organised and marshalled race. 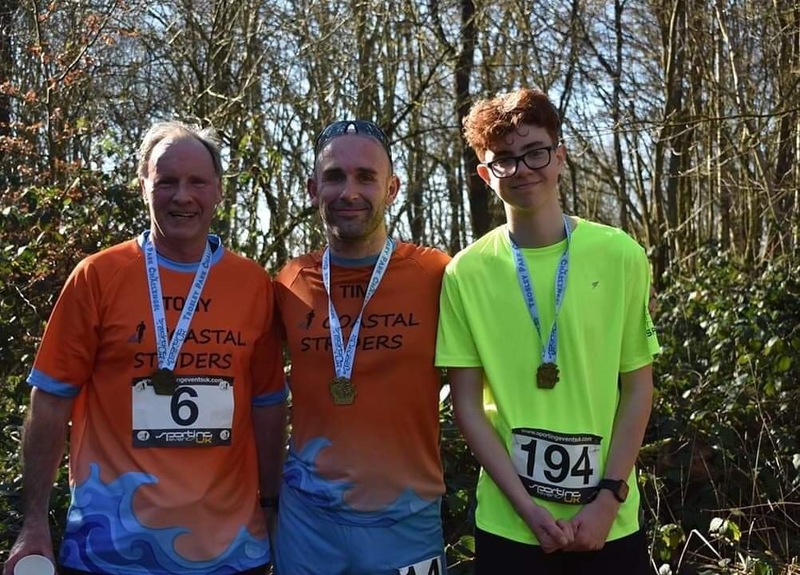 Representing Coastal Striders myself Tim Bray Tony Ansell and Connor Wilcox. On route to Trosley Park the fog was thick and dense in lots of areas. On arrival at Trosley Park surprisingly there was no fog in the lower valleys of the woodland. A fair selection of runners started to gather and it soon got busy. 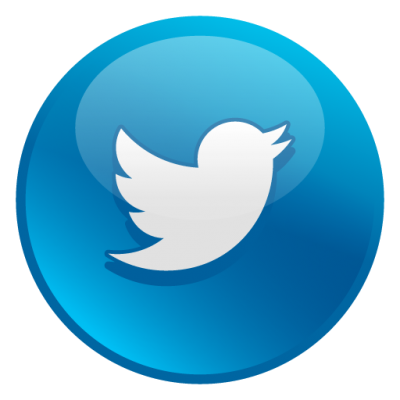 This event as gathered popularity over the last 3 years so it looked like it was going to be a good race. This was Connors first official race for our Club Coastal Striders and he was feeling fine and no signs of nerves. Sporting Events being late in laying the timing mats out the start was delayed by about 3 minutes so that was no big deal. 10:33 at the sound of the horn we was off and on our way. Connor was off really quick and I too started off quickly. A habit all us runners fall victim of all to often. It was a nice flat section to start with and my pace was good and it wasn't that muddy so the going was a good. Then we headed into a sharp right into a nice muddy section which was fun. After that we approached the first downhill section with rather steep steps going downward and thankfully anything like a tree root or rocks protruding outwards were marked with yellow spray paint which came in real handy when running fast. The slope downwards was incredibly narrow and very steep and momentum that you pick up had you charging down quickly. Quick glance at the watch current pace 6:55. Then an abrupt stop to get through the kissing gate. At this point Tony was gaining ground on me and out of the gate he passed me which I was grateful for because Tony is experienced at this event so I wanted to watch his technique of going down the fast slope downwards so I could adopt it and use it for the second lap around. I kept Tony in my sights after that and then we negotiated a slight incline where you meet the Trosley Death Steps as they're correctly named on Strava. These steps were incredibly energy sapping on your legs and to think you had to do this twice had you thinking wow. The rest of the route after that was fine and it's not long till you round the cone and get to do it all again. Second time around I knew what to expect so started to push and I was closing in on Tony and once i got to the Steps again I was feeling my legs burning and Tony was too. Once at the top I got past him and I was on the stretch for home and then I seen Connor walking so I was on his tail. 1km to go I decided to stay where I was and Connor was the first Coastie home in 55:50 then Me Tim 56:00 then Tony 56:36. All in all a tough course and rather challenging. Well done guys. So a year ago I braved the gales on the South Coast doing Worthing Half and thought I wonder what other half mara’s are on this weekend next year.... and Barcelona popped up! And then a few other Coasties followed suit and booked too and made a weekend out of it! Child free (yes we booked grandparents a year ago too!) Michael and I headed out on Saturday morning v early and flew over to beautiful Catalonia. 18 degrees!! Picked up race pack in afternoon spotting Ian Dodds, Lee Field, Sophie Clayton and Rob Gray on the way out. Sunday was another gorgeous day even at 8am walking to the start with the other 19000 entrants very much with sunblock on! Tons of International runners, did see Ian and Claire Morgan before the start and met a load of Brits (RMR and loads of club vests) in starting corrals. Route was nicely undulating (rolling rather than hilly) and very well marshalled with drinks every 5k and aid stations with great support from locals and tourists all round. 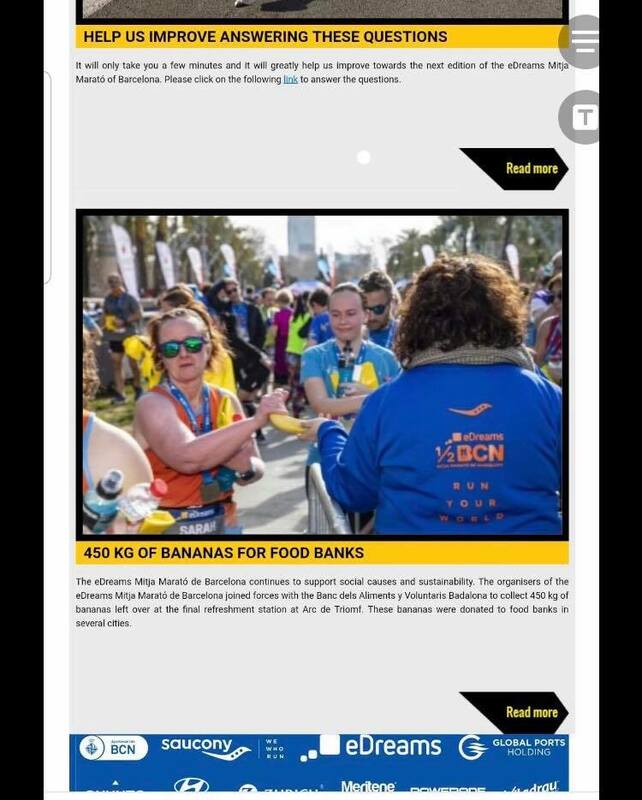 Met Sophie at the end as she must have heard them announce my name and Coastal Striders as I crossed the line to get our medal, cape, fruit, Powerade and water and seem to now feature in the eDreams newsletter getting my banana! Great event. Love this city. Now where next year?! 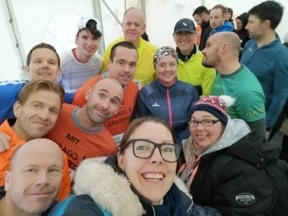 Race report Where to start, with a change of race hq and better access to starting point made a great start to the day, the weather cooperated as well although chilly and breezy made for a good reason to get moving. After meeting Tony Ansell at the start sorry I didn’t see Debbie Foreman Race time as per tradition of most races a congested start, uphill for 100m then onto the windy water filled lanes before the first decent, a bit slippy underfoot in places but manageable, the hedgerows provided much shelter from the wind as we approached the first noticeable incline near Westwell, I started feeling my pace a bit, being greeted by spectators and marshals was a great spur in the right direction. After coming out of Westwell and seeing the M20 in the background I knew it was close to the 5k mark and water station and a couple of inclines left to go. The encouragement going to and fro between the runners was fantastic as we were building up to the 1.1 mile hill climb. The marshals and spectators that had gathered at the section where you run parallel to the M20 gave me the gee up I needed, thank you. The hill climb although doing it last year I had forgotten the length and it just seemed to just go on forever, I paused a couple of times blowing myself out a bit, after emerging at the top it was a pretty flat 1.5 mile to the finish dodging the puddles (lakes) , and at the finish the energy of finished runners, marshals and spectators encouraging a sprint finish.